Agenda, customer management, creation and issue of documents. Specifically created for professionals and small and medium-sized businesses! The plugin created to speed up the daily activities of your company. 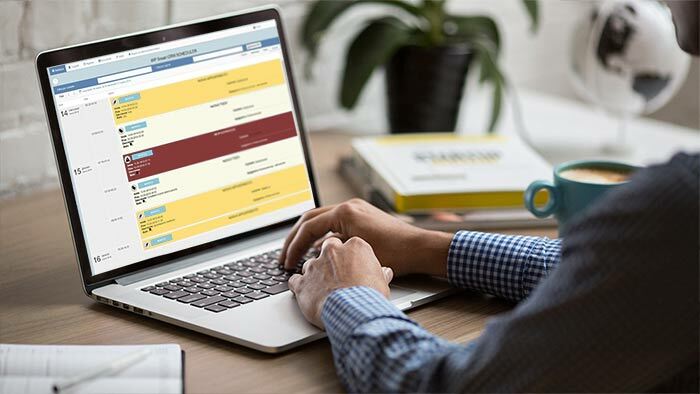 In a single plugin we have grouped together many features that will improve the management of your company and lighten your office work, saving you precious time. You don’t like the idea that your and your customers’ data reside on a cloud server? Our plugin is the solution for you: personal data and documents directly in the database of your WordPress installation! Add WOOComerce products directly form DB while making quotes and invoices through a simple autocomplete field. You can even insert product which are not publihed in your store. 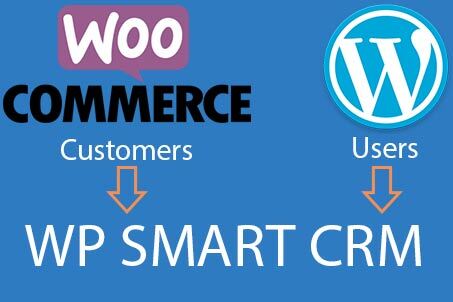 Customers who purchase items from WOOCommerce checkout will be automatically added in CRM. Incredible features in one plugin! We continuously enrich our plugin thanks to the advice of our users. Prevent users of your CRM from accessing the WordPress back office environment. With full-page layout it will seem to access a web management completely disconnected from WordPress! A full-screen agenda with 4 views: monthly, weekly, daily and list. You can create todo, appointments, deadlines and view the automatic payment deadlines of your invoices. With a simple drag & drop you can also move and clone events. 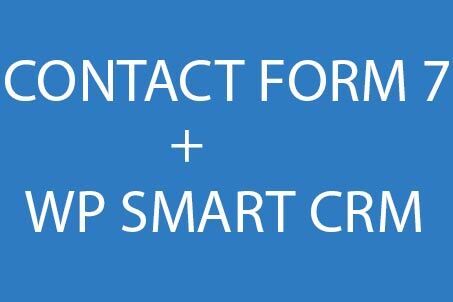 You can add contacts from a CF7 form in the CRM directly from the pages of your website. You can use unlimited contact forms and unlimited fields. 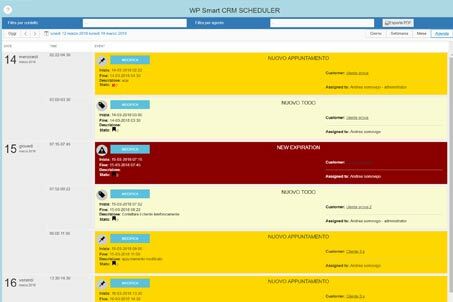 You can manage customers, suppliers, collaborators, employees. You can decide whether to have a single registry or if you keep them separated with tabs. 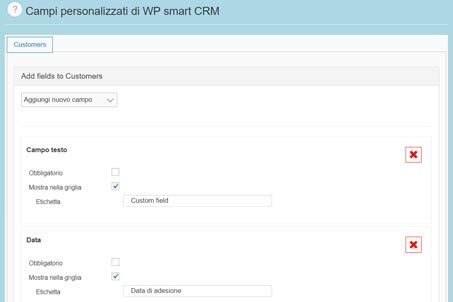 For personal data you can create unlimited custom fields: text, number, date, drop-down menu. You can decide which ones to insert in the contact list grid for a quick consultation. 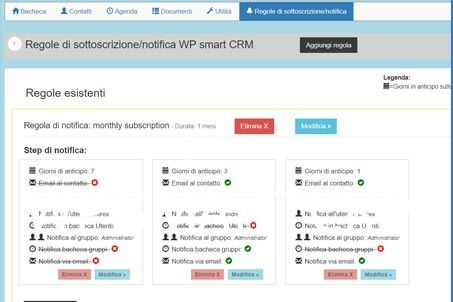 You can send emails to your customers directly from the CRM! Attach the created documents or manually uploaded files. Send the email in copy to other users of the CRM. You can import customers directly from other plugins (eg Woocommerce) or from other WP roles by choosing which fields you want to import. Each contact has a special section where you can upload images and documents, which you can then send by email. Create your notification rules to be associated with your products and services. Schedule notifications of todo and appointments and decide who to send them to. Set reminders for the deadlines of your invoices. 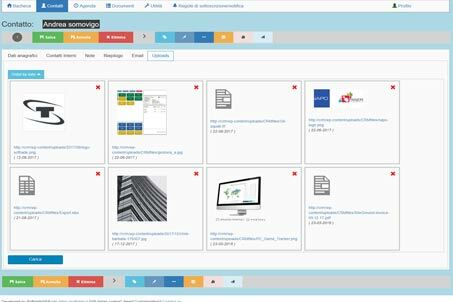 Discover the other features of our CRM! Its easy to use and full of needed features and easy to access to information. 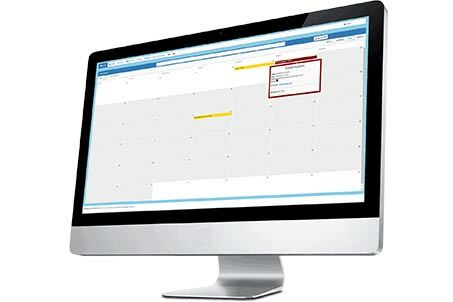 Easy to use good features for appointments, bookings and notes. Saves all notes and appointments in a visible history by dates. Saves all data in visible SQL tables so its easy to update. Good coded plugin and fast support. 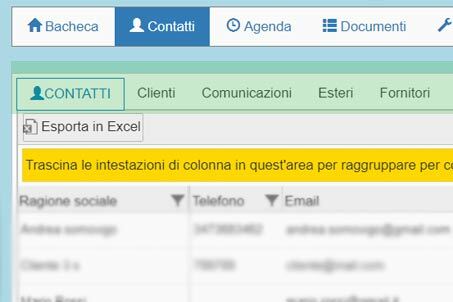 Mi serviva un plugin per sviluppare un sito con CRM integrato per imparare e questo a mio avviso è eccezionale. Recensione a 5 stelle per questo plugin. 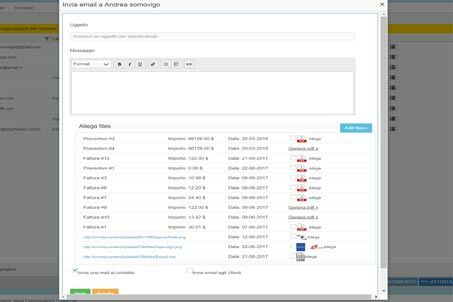 Permette di gestire facilmente gli impegni e le annotazioni per l’azienda. Gestione appuntamenti, agenda, alert, gestione separati agenti, importazione rubrica e creazione documenti fiscali con possibilità di inserimento logo e stampa. Inoltre per ogni cliente inserito è possibile creare anche preventivi!!! Il tutto associato ad un’ottima assistenza, affidabile e veloce!!! Which languages and currencies are supported? If yours is not in the list we can add any international currency on demand. Just ask! Translation strings: IT, EN, FR. Or you can send us your .po and .mo files: we’ll add them to next release. What does a subscription give me? Each subscription, lasting one year, gives you assistance of our developers and free updates. We periodically release a new update, which will be communicated to you through our newsletter. Sure. We are very available to listen to your suggestions. If we believe that the request can be of common interest and enrich the plugin, we will make it for free. If you need full implementation, we will have to do an analysis together and give you a quote. I tried the Free plugin and I want to go to the PRO: I will lose all my data? No. The transition from the Free to the PRO version (and vice versa) does not result in data loss, unless you physically delete the plugin tables from the database. This does not happen if you delete the plugin, it is an operation that must be done directly by PhpMyadmin. I received your plugin update newsletter. What should I do? First click on the link indicated in the email, which will take you to your private area on our site. If you do not remember your login credentials you can ask for password recovery. From your account access the “my downloads” section and click on the link corresponding to the plugin you have purchased. That is always the latest updated version. Now go to your WordPress backoffice, then on plugins and be sure to disable and uninstall the plugin. Then upload the zip file you just downloaded and activate the new version. What should I do to get support? Send us an email to info@softrade.it explaining your problem. Try to be precise and to do, if possible, a practical example. We will contact you as soon as possible to help you solve the problem. Yes, we can sell licenses at a discounted price. Contact us for more information. The license of our plugins for years after the first one is 50% discounted. If your license has expired or is about to expire contact us to renew it at a discounted price.